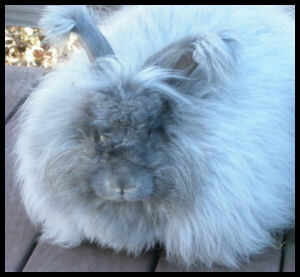 Angora wool comes from any variety of Angora rabbit. Not to be confused with the Angora goat, which produces mohair, angora wool is known for its softness and “halo” effect or fluffiness and has a very silky texture. The wool of the Angora rabbit is warmer and lighter than most other wools and comes in a variety of colors. The pre-washed weight of this fiber is mostly due to the amount of saliva found on the wool. The saliva contributes to the allergen factor, so it is important to wash the wool carefully and thoroughly as part of the processing. Typical micron count of angora ranges from 12-16 which indicates fine wool. Angora rabbits have both down, or an undercoat, and guard hairs. Excess guard hairs should be removed for the best quality finished product. Angora can be used alone as an enhancement to a garment or blended with other fibers for strength, durability and a profound effect on any finished product!